In most cases you’re running into issues that are fundamental to silicone technology. Several of those have been overcome by Lexel® co-polymer-based rubber sealant, a different technology than silicone. Let’s look at 4 performance areas that make Lexel® a more powerful product in your hand. You may have experienced that ‘clear’ silicones are translucent but not really clear. 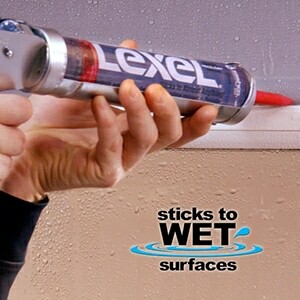 If you need a ‘water-clear’ sealant Lexel® is a great answer. I used it to seal around the brass bezel in my shower, and in between my wood floor and the trim. It keeps out water in both places and the best part is that you can’t see it! If you are caulking against a painted surface, chances are that surface will eventually need re-painting. If you have run silicone sealant on it, then you have also just run out of luck. Most contractors know that paint, whether water- or oil-based, just won’t stick to silicone. Many a DIYer has found that out the hard way. Oil-based paints can appear to cover the silicone but when they dry, they flake off like a rattler shedding skin. Silicones will also leach plasticizers into porous substrates such as siding and interfere with paint adhesion. Lexel® takes latex and oil-based paints well. However, there is a caution when painting it with oil-based paints. Allow the sealant to cure for an extended 10-14 day period. Lexel® cures by solvent release and even a small amount toward the end of cure can interfere with the cure time of oil-based paints. With that in mind, paint away! Silicones can have excellent adhesion especially to glass and metals. Yet be careful to match the type of silicone to the substrate. For example, we’ve all opened a silicone cartridge and noticed that sharp vinegar smell. That type of silicone produces acid and will tend to eat concrete rather than stick to it. You must know which silicone technology you are using and match it to the surfaces you have. That brings up a more complicated issue. Suppose you are caulking between brick and a window frame. You need to make sure the silicone you use is compatible with both the mortar and the window frame which could be vinyl, wood, or various metals. 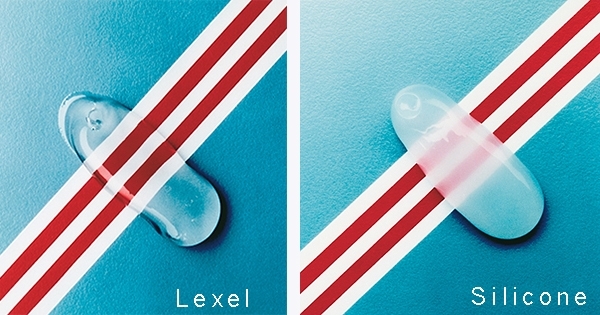 Lexel® has tremendous adhesion across a very wide variety of surfaces. This includes metals, wood, plastics, glass, tile, and painted surfaces. It even adheres to difficult plastics such as PVC and acrylic. And if you need to seal a leak in the rain it will stick to wet surfaces. This means there is no worry about sealing 2 or even 3 different surfaces at once. You may have observed that silicone sealants tear easily. One little nick in the bead and a tear can run down it like a zipper. Not so with Lexel®. It is tough and has excellent tear resistance. That pays off even more when it comes to adhesion. Silicones won’t stick to themselves nor will other sealants stick to silicones. Once they tear, they must be completely removed, and you start over. Keep in mind that it is difficult to remove all the silicone off the surface so that another sealant will adhere. Lexel® sticks to itself, so if it ever needs repair, clean it and go right over the top. That’s what Lexel® can give you. It has performance properties that overcome issues you may not have known existed and more uses than you can imagine. That’s why I’m a self-confessed Lexel® junky. I use it for scores of repair jobs and keep a squeeze tube in the junk drawer. To recount a few, I’ve patched jeans, repaired books, sealed my shower door, and repaired a leak in my swamp cooler pan. 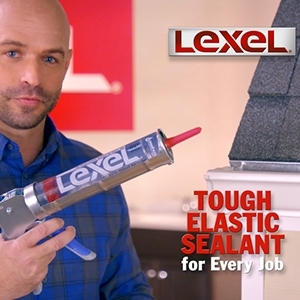 Any place you need an elastic sealant that sticks like crazy, Lexel® could be your answer. To learn more visit https://www.lowes.com/pd/Lexel-10-5-fl-oz-Clear-Paintable-Solvent-Caulk/4714985.